This teaching assistants are fab ice lolly print is a fabulous and unique gift idea for your kid’s classroom teaching assistant. Let them know what a great job they do and just how fab they are! The design shows three funky fab ice lollies, in pink, yellow and green, with the text ‘Teaching Assistants are fab’ along the bottom. The print is available in 7×5 inch unframed, 7×5 inch framed, A4 unframed, A4 framed and A3 unframed. This print is available in five variations; 7×5 inch unframed, 7×5 inch framed, A4 unframed, A4 framed and A3 unframed. The product image shows the A4 framed print. If you choose the 5×7 inch or A4 framed print, the frames have a beautiful oak finish as shown in the photo. The 7×5 inch frame measures 155mm x 205mm and the A4 frame measures 235mm x 325mm. The frames can be hung on a wall but also have a stand on the back so they can be stood on a flat surface. Please note, framed prints are available for UK delivery only. The 7×5 inch unframed print and A4 unframed print will be supplied in a cello bag with a rigid piece of cardboard. The A3 print will be protected with tissue paper, carefully rolled up and placed in a tube. The prints will fit in any widely available 7×5 inch, A4 or A3 frame. 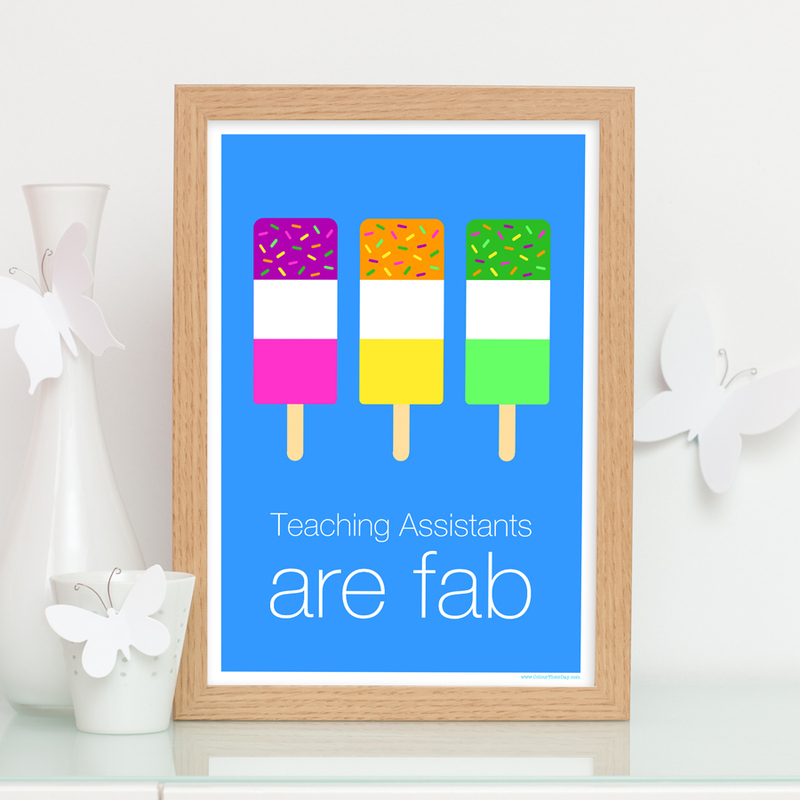 Be the first to review “Teaching Assistants Are Fab – Ice Lolly Print” Click here to cancel reply.